Miniatures & Deluxe game day case prototypes. We are working hard here to develop some new gaming cases. We have 2 that are very close to completion. One is for Miniatures storage and transport and the other is an affordable version of the case I made for myself. The one that started this whole REP Gaming Products thing! Starting with the miniatures case: It is designed to hold 31 miniatures of the most common sizes. Why 31? Why not I say! (honestly, it is simply because that was how many compartments we could fit into it). This case has our typical hardshell wooden exterior, wrapped in supported vinyl and finished with armored corners. We put a heavy duty lockable draw latch on it to make sure this doesn't come open by accident. (really its just because we think it looks cool, but thats not good marketing!). The interior has compartmented foam in the base and 1/4" foam in the lid. Your miniatures will be safe and secure. Lastly, the size of this case makes it easily fit in your backpack. Outside dimensions are 12.5" x 11" x 2.75". This case has our standard hardshell wooden exterior, wrapped in supported vinyl. 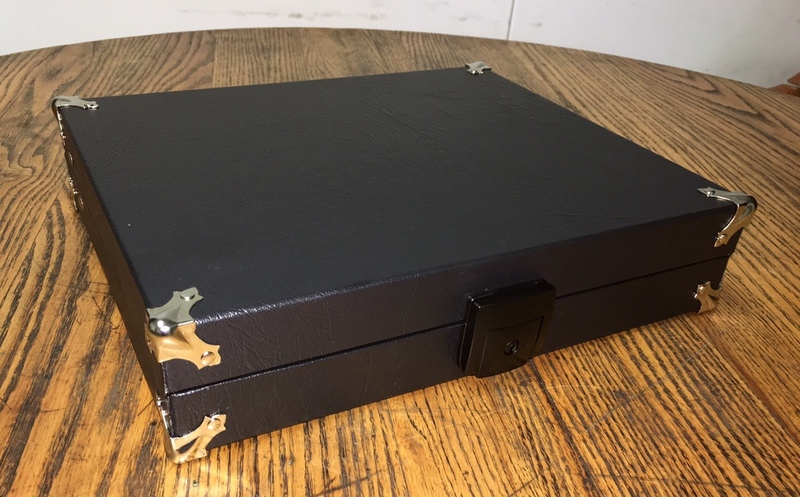 However this one has protective edge binding sewn around the top and bottom of the case (thats correct, we have sewing machines that can sew through wood!) along with armored corners. This case will have (although its not pictured here) the same lockable latches as the miniatures case above. Lastly, it includes a carrying handle for briefcase style carrying. The interior includes a foam lined lid, lid stays (to hold it open) as well as a compartmented foam bottom. So, if you want to look really cool, take this to your local game night handcuffed to your arm (make sure you have the key!) and you will win simply due to your pure awesomeness! We would love to hear your thoughts on these new gaming cases! Thanks for reading and please feel free to comment below!